The new BMW M2 is designed for uncompromising driving dynamics and it sets new standards in the compact sports car segment. With the KW 3 Way Clubsport coilover kit it is possible to optimally adjust the driving behavior of the BMW M2 to reach fast lap times at the race track. 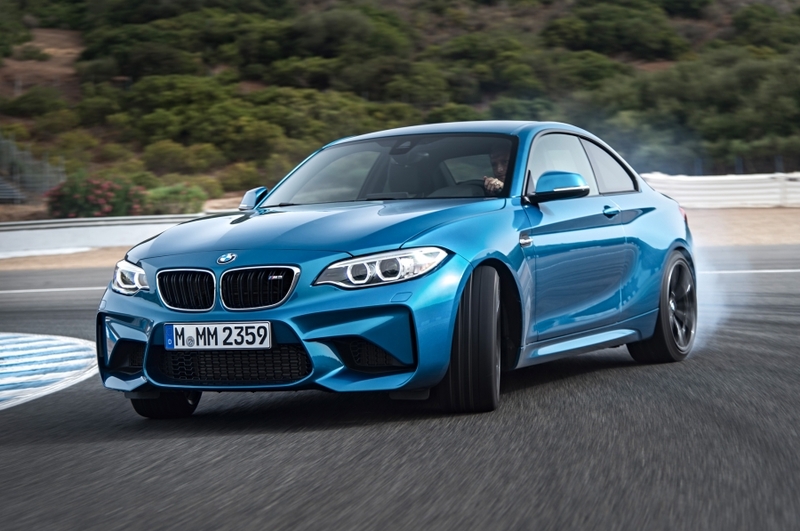 For example, the prevailing conditions on the Nürburgring Nordschleife can optimally be considered and in addition, the BMW M2 can be lowered continuously by up to 45 mm with the Clubsport suspension. So the demanding sports car drivers are not only able to select from the available “Track-Setup” and “Road-Setup” recommended by KW development engineers and test drivers, but the KW racing valve technology used even allows individual damper settings. A BMW M2 equipped with a KW 3 Way Clubsport coilover kit drives extremely precise and direct in all driving situations. 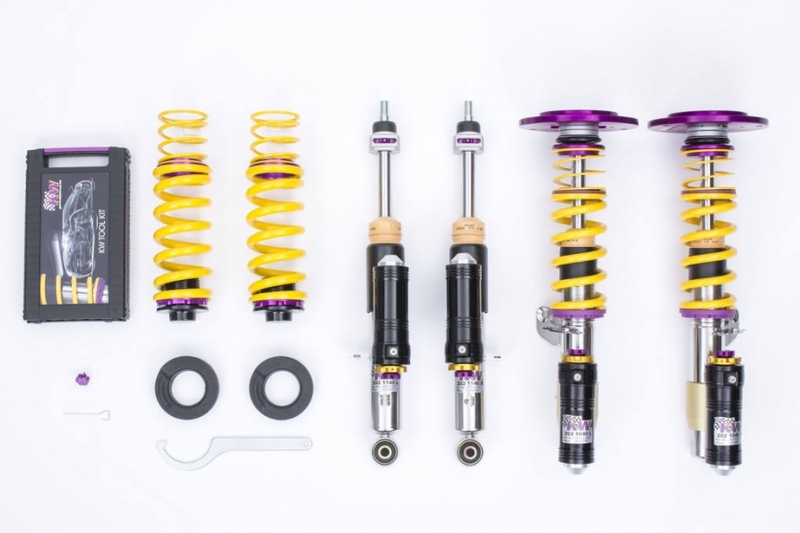 In addition to the racing spring system used, the KW 3 Way Clubsport way coilover suspension differs from conventional sports suspensions and coilovers mainly by its adjustable KW 3 way high-performance dampers. At the upper end of the piston rod, the rebound can be adjusted with 16 exact clicks via the rebound adjustment wheel. Increased rebound forces ensure a stiffer handling and significantly less body roll. So at very high speeds, the steering precision is noticeably improved at the limit of driving dynamics, while a lower rebound force is better on uneven and wavy road surfaces. In addition, the compression damping in the high-speed range can be changed manually with 14 clicks and the low-speed compression with six clicks. Here we are using our patented valve technology with two throttle valves. The low-speed is always designed linearly, while for the high-speed we configure the spring-loaded valve digressively. So from a certain system pressure, depending on the selected setup, the high-speed valve can open sooner or later. A harder low-speed setting additionally creates a more direct steering response on the front axle and it acts against oversteering on the rear axle without a negative affect the deflection behavior of the high-speed compression range when driving fast over bumps and curbs. Other unique features are partially hard coated components made of aircraft aluminum alloys and special brass alloys which not only guarantee an excellent durability but are also low maintenance. In addition, the alloys provide a lower friction in the damper working space, in order to reduce breakaway moments. With the Clubsport top mounts, the camber angle can be optionally changed for an optimum contact surface of the tires when driving fast into corners. With the KW 3 Way Clubsport coilovers, the BMW M2 receives the same suspension technology as the BMW M4 GTS and the successful BMW Z4 GT3, with which BMW claimed the overall victory at the 24 hours of Spa-Francorchamps race in 2015. Just like the KW Clubsport coilovers available for the BMW M4, the KW 3 Way Clubsport coilover suspension is also made of stainless steel for the BMW M2 and has been homologated for use on public roads. So after a successful track day, the setup can be changed to a more comfortable setting and the trip home can be started with the M2 driving on its own four wheels instead of being towed in a trailer. The lowering can be continuously adjusted at any time and the changes are made directly on the stainless steel strut via the dirt-resistant KW trapezoid thread. The stainless-steel KW Clubsport coilover kit for the M2 allows a continuous lowering of 15 – 40 mm at the front axle and 20 – 45 mm on the rear axle.